Rev David J Thom was inducted as Minister of the Charge of Gigha and Cara linked with Kilcalmonell linked with Killean and Kilchenzie at Muasdale Church on Saturday 21st September 2013. The service was conducted by Rev David Mitchell, Moderator of Presbytery, and was followed by tea in Tayinloan Village Hall. David comes to Argyll from the Presbyterian Church of Canada, and is living with his family in the Manse in Muasdale. 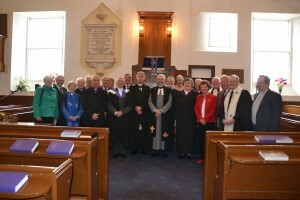 The photo shows David (just to the left of centre) with the Presbytery members who were present at the service.